The warm weather is finally here and so is my visible baby bump. 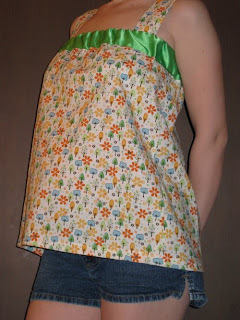 In keeping with my goal not to invest in maternity clothes, I decided to make a few tops with fabric I had in my stash. My main goal was have designs that can be worn when I'm back to my non-pregnant shape. What's the point of making or buying stuff that is only wearable for a couple of months? The first is my own design. I just loved this tree print fabric, but bought only 1 yd with the intention of making a tote bag so to make sure there'd be enough length for a top I stitched satin blanket binding on the top and fed 1.75" wide elastic through to give length and a nice drape. I'm really looking forward to wearing this out and about. The second is using McCalls 5050 which I've made before in the long sleeved style. I love how this turned out and was really happy to find a way to use this fabric. It's vintage from the 60s satin that I'd found in a fabric stash my grandmother had left me. Funny how in style this print still is. Comfy, $0 and practical!! Congratulations for making it into the top ten spring tops, the satin fabric is beautiful! I just wanted to say how much I love those tops and I'm NOT pregnant. And I wanted to say how beautiful you look. You wear pregnancy very well.